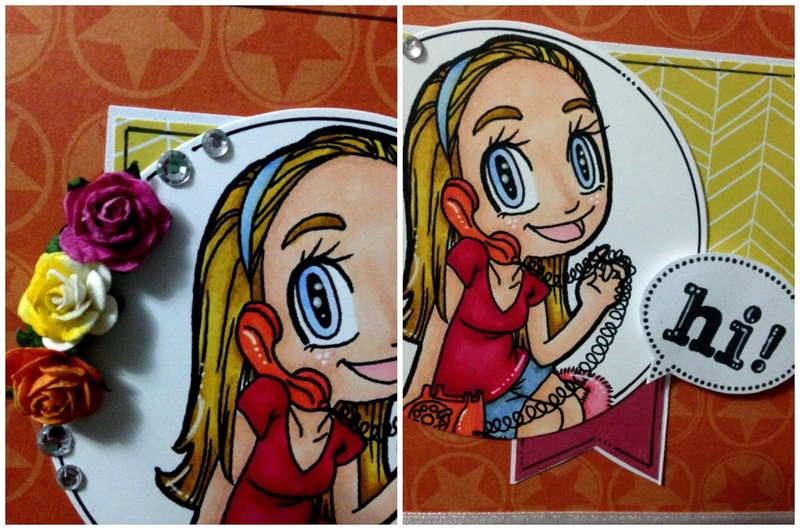 Jess' Crafts: Some Odd Girl - Telephone Mae - Hi! Some Odd Girl - Telephone Mae - Hi! Back again, this time, with a card for my etsy and madeit stores, because they're feeling a little unloved! Don't forget the coupon sale in my etsy store, until June 1st... Just use coupon code ASSIGNMENTCLEARANCE to receive 15% off your entire order! I started by printing the digital stamp - Phone Call Mae (Some Odd Girl) and colouring her using my Spectrum Noir markers. I die cut her out and then selected my papers, which are a mix of Bella Blvd, a no name branded one (the yellow) and Teresa Collins. The sentiment is from MFT and I hand cut the speech bubble, as I couldn't find the matching die. I doodled around all the edges, and added a strip of white satin ribbon, and a trio of flowers. Just love this! How you cropped the image is really creative! This is adorable!! I love the flowers and rhinestones...perfect addition to make her pop! Thanks for joining our May Linky Party at Some Odd Girl! Really nice card. I love your speech bubble and the wonderful doodling. Thanks so much for joining us at ATS&M for Anything Goes! Looove how you cut the image!! Thanks for joining our Some Odd Girl Linky Party! !